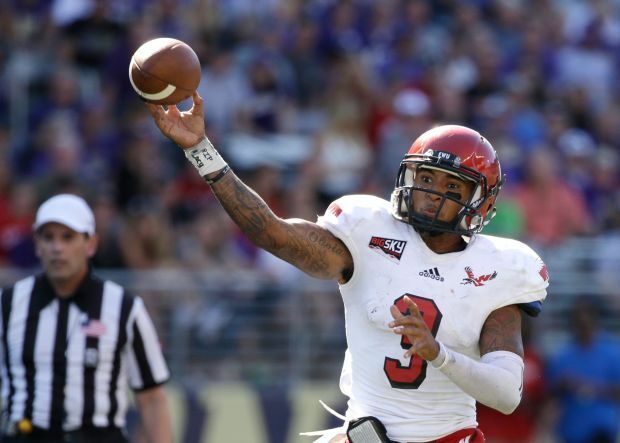 The 2014 FCS Playoffs First Round featured 8 exciting games. There were surprises, some blowouts, and some expected results. Below is a look at what happened in all 8 games. The second round matchups for the 2014 FCS Playoffs can be found at the bottom of the page. As expected, Fordham took care of Sacred Heart in the first round matchup. Fordham won 44-22 by putting up 20 second half points. Fordham took advantage of an early turnover by Sacred Heart by throwing a 1 yard touchdown pass from Mike Nebrich to Tebucky Jones Jr. They doubled their advantage with a 50 yard connection from Nebrich to Brian Wetzel. Sacred Heart cut into the lead with a field goal followed by a 10 yard touchdown pass from RJ Noel to Tyler Dube. The extra point was missed an Fordham held a 14-9 lead at the end of the first quarter. The second quarter had a series of miscues featuring both teams. First, Sacred Heart had a 23 yard field goal blocked, then Fordham fumbled on their own 42 yard line. RJ Noel then threw an interception in the end zone before Nebrich responded with a pick of his own. Sacred Heart ended the series of follies with a bobbled snap on a punt that set up a 25 yard field goal for Fordham. Sacred Heart responded with a 2 yard touchdown pass from Noel to Dube. With less than 10 seconds left Fordham went up 24-16 with a 14 yard touchdown pass from Nebrich to Wetzel. Fordham’s first offensive play of the third quarter resulted in Nebrich hitting Jones Jr. for a 97 yard touchdown. Fordham added a 23 yard field goal after another bobbled snap on a punt by the Pioneers. Sacred Heart scored their final points on the following drive with a 22 yard touchdown run from Keshaudas Spence. Both quarterbacks traded interceptions in the opponent’s territory to end the third quarter. Fordham led 34-22 with 15 minutes to play. Fordham added another field goal and a 26 yard touchdown run from Chase Edmonds in the fourth quarter to win 44-22.
RJ Noel went 19 of 40 for 206 yards with 2 touchdowns and an interception for Sacred Heart. Sean Bell had 15 carries for 112 yards while Keshaudas Spence had 10 carries for 54 yards and a touchdown. Tyler Dube led the Pioneers with 7 catches for 98 yards and 2 touchdowns. Mike Nebrich had a stellar day through the air with 423 yards, 4 touchdowns, and 2 interceptions on 29 of 50 passing. Chase Edmonds had 91 yards and a touchdown on 24 rushing attempts. Brian Wetzel caught 8 passes for 166 yards and 2 touchdowns and Tebucky Jones Jr. caught 8 passes for 139 yards and 2 touchdowns. Indiana State trailed 16-0 early in the second quarter, but rallied to score the final 36 points in a 36-16 win over Eastern Kentucky. Indiana State quarterback Mike Perish threw for 407 yards to spark the Sycamores to the second round. The game started poorly for the Sycamores. They went for it on fourth and one from their own 44, but came up short on their rushing attempt. Eastern Kentucky turned that into a field goal for a 3-0 lead. Another field goal by Eastern Kentucky was followed up by a 17 yard touchdown run from Dy’Shawn Mobley. The Colonels led 13-0 at the end of the first quarter. Mike Perish threw an interception early in the second quarter, which was turned into a third field goal from Andrew Lloyd. That made it 16-0 and it would be the final points scored by Eastern Kentucky. The Sycamores got on the board with 2 seconds left with Perish hitting Robert Tonyan Jr. for a 4 yard touchdown pass. That made it 16-7 at halftime. Indiana State’s first possession of the second half yielded a 48 yard field goal from Eric Heidorn, but the second possession yield the lead. Perish connected with Kyani Harris for a 57 yard touchdown and a 17-16 lead. Another punt by the Colonels turned into a touchdown for the Sycamores offense. Perish hit Gary Owens for a 38 yard touchdown and a 24-16 lead. However, the big blow came on the next drive for Eastern Kentucky’s offense. Mark Sewall intercepted Bennie Coney’s pass and returned it 48 yards for a touchdown to make it 31-16 at the end of three quarters. The fourth quarter opened up with both teams squandering chances. First, Eastern Kentucky failed to convert a fourth and 7 on the Indiana State 33 yard line. Next, Perish threw his second pick of the day in the Colonels’ end zone to take points off the board. The Colonels turned around and threw a pick of their own on the next drive before Indiana State failed to punch the ball in on fourth and goal from the one. The Sycamores defense would force a safety after failed fourth and goal attempt at the one. ISU added a 30 yard field goal to cap the scoring at 36-16. Mike Perish went 41 of 57 for 407 yards with 3 touchdowns and 2 picks. Buck Logan led the Sycamores with 10 carries for 33 yards. The receiving yards were well distributed with Kyani Harris leading the receivers with 5 catches for 91 yards and a score. A.J. Johnson had 7 catches for 71 yards and Jamar Brown had 6 catches for 63 yards. Bennie Conley went 15 of 34 for 200 yards with no touchdowns and 2 picks for Eastern Kentucky. Dy’Shawn Mobley had 22 carries for 96 yards and a touchdown. Jeff Glover was the top receiver with 74 yards on 4 catches. Northern Iowa scored 23 first quarter points and cruised home from there to defeat Stephen F. Austin 44-10 in the first round of the 2014 FCS Playoffs. Northern Iowa’s first play from scrimmage was a 73 yard touchdown run by David Johnson and the defense would give the offense another boost on SF Austin’s first drive. On third and 11, Deiondre’ Hall picked off a pass and brought it back to SFA’s 9 yard line. That would result in a 10-0 lead after a 30 yard field goal from Michael Schmadeke. Another turnover by the Lumberjacks resulted in a 36 yard field goal. After a punt by SFA, Northern Iowa had to settle for a third field goal of the first quarter to take a 16-0 lead. The Panthers finally got a second touchdown late in the first quarter with Johnson punching in his second from a yard out and give Northern Iowa a 23-0 lead. It took until midway through the second quarter for SFA to score, but they got a 32 yard touchdown run from Gus Johnson after a lost fumble from UNI’s David Johnson. The following drive resulted in redemption for David Johnson – he took a pass from Brion Carnes 70 yards to the house and a 30-7 lead. That score would hold up until halftime. In the third quarter, David Johnson scored his fourth touchdown of the day with a 6 yard touchdown run. The defense continued to suffocate the Lumberjacks, as the score after three quarters was 37-7. Brion Carnes ran for a 22 yard touchdown for the Panthers before SFA hit a 31 yard field goal to cap the scoring. It was not a good day for the Stephen F. Austin quarterbacks. Zach Conque went 15 of 26 for 83 yards and an interception with Hunter Taylor going 7 of 13 for 50 yards. Gus Johnson was the majority of the offense with 20 carries for 82 yards and a touchdown. Johnson also was the leading receiver with 37 yards and 4 catches. Brion Carnes completed only 5 of 18 passes, but that was for 208 yards and a touchdown. He also ran 6 times for 46 yards and touchdown. David Johnson had 23 carries for 152 yards and 3 touchdowns while also catching 2 passes for 84 yards and another score. Montana dominated San Diego in every facet of the game on their way to a 52-14 destruction of the Toreros. The Grizzlies did not score until their second possession of the game when Jordan Johnson connected with Jamaal Jones for a 22 yard touchdown pass. Johnson connected with Jordan Canada on the next drive for a 3 yard touchdown and a 14-0 lead for Montana. After a three and out for San Diego, their punt was returned 60 yards for a touchdown by John Nguyen to make it 21-0. A fumble by San Diego on their next possession was turned into a 41 yard field goal and a 24-0 lead. It would be 38-0 at halftime after Johnson to Jones for the second time from 30 yards out and Canada’s 17 yard touchdown run. Montana’s first drive of the second half resulted in an 18 yard touchdown pass from Shay Smithwick-Hann to Joshua Janssen. San Diego went for it on fourth down on their next two drives despite being inside their own 40 yard line. Neither time did they convert and the latter set up a touchdown for Montana. That touchdown came early in the fourth quarter with Smithwick-Hann hitting Kevin Berland for a 12 yard score. San Diego would score their first points two drives later when Dallas Kessman connected with Justin Priest for a 27 yard touchdown. The ensuing kickoff was fumbled by the Grizzlies and San Diego turned that into another touchdown. Trey Wheeler hit Justin Priest for an 11 yard touchdown. The Toreros struggled to move the ball all game long. They managed to gain only 158 yards of total offense and converted 2 of 13 third down. Trey Wheeler was their best passer going 4 of 4 for 41 yards with a touchdown. Keith Williams went 6 of 18 for 34 yards as the starter. Dallas Kessman was the top rusher with 30 yards on 10 carries. Justin Priest had 2 catches for 38 yards and 2 touchdowns. Jordan Johnson went 13 of 20 for 153 yards and 3 touchdowns. Jordan Canada ran 17 times for 105 yards and a touchdown while Lorenzo Logwood had 17 carries for 59 yards. Jamaal Jones caught 6 passes for 93 yards and 2 touchdowns. A de facto Southland Championship game turned out to a thriller, as Sam Houston State rallied for the 21-17 win over Southeastern Louisiana. Southeastern Louisiana got on the board right away with a 25 yard field goal. That was set up by a lost fumble on the opening kickoff by the Bearkats’ Ridgeway Frank. The Bearkats struggled to move the ball in the first quarter getting only as far as their 47 yard line. Outside of the early field goal, Southeastern Louisiana did not threaten until late in the first quarter. That drive to end the first quarter spilled over to the second quarter where Bryan Bennett ran 9 yards for a touchdown and gave the Lions a 10-0 lead. The Bearkats had an excellent drive in response, but their fourth and goal play ended in disaster, as they lost 5 yards. The last two minutes ended with multiple turnovers. First, Jared Johnson threw a pick to the Lions’ Micah Eugene. The Lions turned around and lost a fumble on the next series. However, Johnson’s desperation heave into the end zone was picked and the score remained 10-0 at halftime. It took until midway through the third quarter, but Sam Houston State got on the board with a 3 yard run from former Texas Longhorn Jalen Overstreet. Later in the third quarter, a poor punt put Sam Houston State at the Southeastern Louisiana 32 yard line. On the next play, a trick play by the Bearkats led to an interception and possible points being kept off the board. The Bearkats caught a break late in the third quarter when the Lions fumbled the punt return at their own 4 yard line. The third quarter ended with Southeastern Louisiana holding a 10-7 lead. The first play of the final quarter was a 1 yard touchdown from Donavan Williams. That gave the Bearkats a 14-10 lead, but it would not last for long. The Lions marched right down the field and took the lead back at 17-14 with Bryan Bennett’s 2 yard touchdown run. The Lions looked to extend their lead on the following drive, but Michael Wade blocked the field goal to spark the offense. That led to Williams punching the ball in from 5 yards out for a 21-17 lead. The Lions were unable to get the ball into Sam Houston State territory for the remainder of the game and fell by that 21-17 score. Bryan Bennett went 17 of 48 for 181 yards and also had two rushing touchdowns. Kody Sutton had 42 yards on 13 carries. Devante Scott had 5 catches for 53 yards. Southeastern Louisiana had 305 yards of total offense, but went 7 of 24 on third down. Jared Johnson went 12 of 32 for 119 yards with 2 interceptions. He managed to lead the team in rushing with 63 yards on 17 carries. Jalen Overstreet had 50 yards and a touchdown on 15 carries. LaDarius Brown caught 3 passes for 51 yards. Perhaps the upset of the day lies in this game where Liberty beat James Madison 26-21. The Flames trailed 21-10 at halftime, but scored the last 16 points to pull the upset. Liberty started the game with the ball and managed to get down the JMU 22 yard line. A lost fumble cost them a chance at points, but the Dukes could not make them pay. Liberty would take the lead on the next drive with a 26 yard field goal from John Lunsford. James Madison responded with a solid drive, but their fourth and three attempt at the Liberty 15 yard line came up short. Liberty led 3-0 at the end of the first quarter. The first play of the second quarter was a 19 yard touchdown run for Liberty’s D.J. Abnar to make it 10-0. James Madison answered right away on their first play from scrimmage in the second quarter with Jauan Latney rumbling for a 73 yard touchdown run. Liberty had a solid drive halted on an interception and that was turned into a touchdown by James Madison. Vad Lee scrambled for a 9 yard touchdown run to give the Dukes a 14-10 lead. The next Liberty drive ended in the same fashion – with an interception. That too turned into a touchdown when Lee hit DeAndre’ Smith for a 16 yard touchdown pass. The Dukes led 21-10 at the break and appeared to be in control of the game. Liberty’s first drive of the third quarter was what they need to stay in the game. Abnar ran for his second touchdown to make it 21-17. The next Liberty drive resulted in a great 56 yard field goal from Lunsford and the Flames trailed just 21-20 at the end of three quarters. The fourth quarter was dominated by Liberty’s offense. They embarked on an 85 yard, 17 play drive that burned 11:01 off the clock and left only 2:53 for James Madison to score. Nicky Fualaau pounded the ball in from a yard out to give them a 26-21 lead. The two point conversion was no good and the Dukes faced a daunting task. James Madison managed to get Liberty 27 yard line, but Vad Lee’s fourth and 13 pass fell incomplete and Liberty held on for the win. Vad Lee went 18 of 35 for 139 yards with a touchdown and a pick. Lee also ran 15 times for 57 yards and a touchdown. Jauan Latney had 15 carries for 119 yards and a touchdown. Brandon Ravenel caught 7 passes for 54 yards. In one of the more formful games of the day, Richmond dispatched Morgan State with a 46-26 win. Richmond’s Michael Strauss threw 4 touchdown passes in the victory. Richmond wasted little time taking the lead with Strauss hitting Reggie Diggs for a 16 yard touchdown pass. An interception by Morgan State on their first drive was turned into a 1 yard touchdown run for Seth Fisher and a 15-0 lead for Richmond after converting a two-point conversion. Fisher added another one yard touchdown run on the next drive to make it 22-0 at the end of the first quarter. Morgan State hit a 29 yard field goal to get on the board in the second quarter and actually made it 22-10 after a 3 yard touchdown run by Moses Skillon. That touchdown was set up by Strauss’ interception. Late in the quarter, Strauss hit Diggs for a second time, this one from 11 yards out to make it 29-10 at the break. Morgan State turned the ball over on their first second half possession and the Spiders made them pay with Strauss hitting Fisher for a 22 yard touchdown pass. The Bears responded two drives later with a 46 yard touchdown pass from Skillon to Andrew King to make it 36-17 in favor of Richmond. Skillon would throw a pick on the next drive, which led to a 42 yard field goal for Richmond and a 39-17 lead at the end of three quarters. Skillon threw his third interception early in the fourth quarter and Strauss threw his fourth touchdown pass as a result. He connected from 38 yards out with Rashad Ponder. Skillon came back and threw an 8 yard touchdown to Ladarius Spearman to make it 46-24. Moses Skillon went 23 of 45 for 285 yards with 2 touchdowns and 3 interceptions. He also had 36 yards and a touchdown on 10 carries. Herb Walker Jr. ran 21 times for 120 yards to lead the Bears in rushing. The top receiver was Andrew King with 80 yards and a touchdown on 5 catches. Michael Strauss went 22 of 32 for 272 yards with 4 touchdowns and an interception. Jeremiah Hamlin had 51 yards on 10 carries while Seth Fisher had 14 carries for 47 yards and 2 touchdowns. Reggie Diggs caught 8 passes for 132 yards and 2 touchdowns. The game of the day was played in the worst conditions of the day. 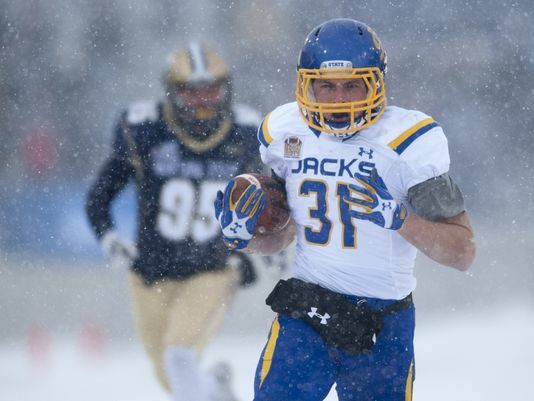 A snowstorm blanketed the field between South Dakota State and Montana State, but that did not stop the Jackrabbits from winning 47-40. 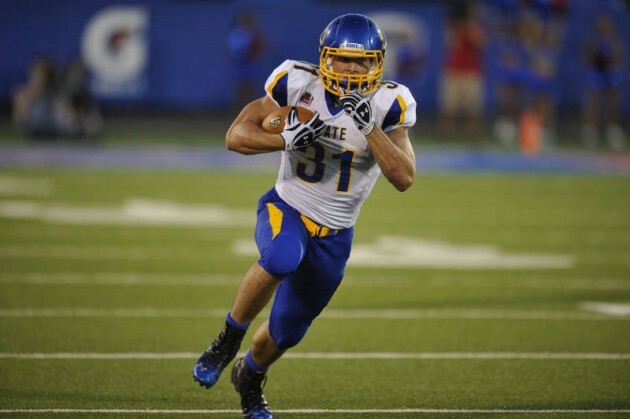 Zach Zenner had 324 yards and 5 touchdowns on offense to lead South Dakota State into the second round. It did not take long for Zenner to get going. On the second play from scrimmage, he ran 45 yards for a touchdown and a 7-0 South Dakota State lead. The Bobcats answered back with a 3 yard run from Chad Newell, but a botched extra point made it 7-6. On the next drive, Zenner would take a little swing pass 69 yards to the house and a 14-6 lead. The Jackrabbits would settle for a 21 yard field goal early in the second quarter to take a 17-6 lead. After back-to-back punts, Montana State got back on the board with a one yard touchdown run from Newell. The Bobcats converted the two-point conversion to make it 17-14. However, the Jackrabbits responded immediately with Zenner running for a 7 yard touchdown. Montana State got a late touchdown with Dakota Prukop finding Mitchell Herbert for a one yard touchdown pass. However, in a recurring theme, the extra point was blocked and South Dakota State held a 24-20 lead at halftime. The second half began with Montana State taking the lead on Newell’s third touchdown run from 12 yards out. Once again, the extra point snap was botched and the Bobcats only held a 26-24 lead. It took three plays for the Jackrabbits to respond and it was Zenner again. He ran 60 yards down the sideline and made a defender miss on his way to the end zone and a 31-26 lead for South Dakota State. The Bobcats had a chance to regain the lead, but a personal foul penalty put them in fourth and 20, which was not converted. The third quarter ended with South Dakota State hanging on to a 31-26 lead. South Dakota State extended their lead to 37-26 on Austin Sumner’s 10 yard touchdown pass to Connor Landberg in the corner of the end zone. It almost did not happen when Sumner nearly threw a pick six, but the defender dropped the interception. A fumble by Montana State on their ensuing drive resulted in a 30 yard field goal for the Jackrabbits and a 40-26 lead. Chad Newell ran for another touchdown from 6 yards out to close it to 40-32 with two-point conversion failing. Then came Zenner’s fifth touchdown. He broke a tackle 5 yard beyond the line of scrimmage and then outran the defense to end zone for a 69 yard touchdown. That made it 47-32. The Bobcats got a late touchdown from Newell from 5 yards out, which was his fifth of the game. Two point conversion was good and made it 47-40. The ensuing onside kick was originally recovered by the Jackrabbits’ Dallas Goedert, but he fumbled when he was hit going to the ground. 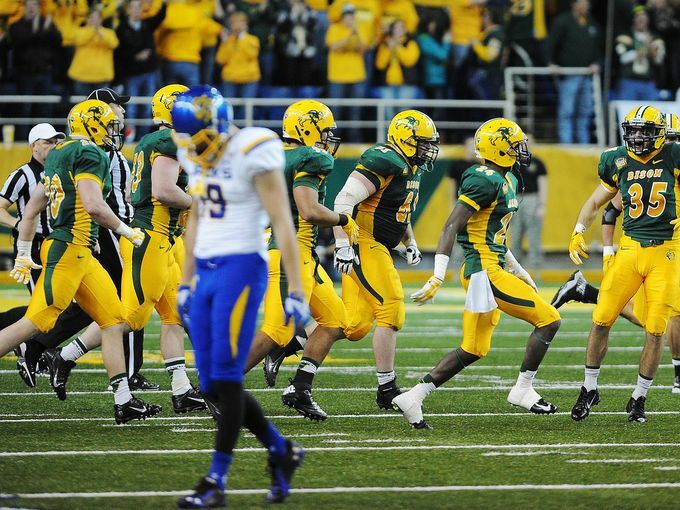 Luckily for South Dakota State, Connor Landberg recovered the ball that was kicked up to him. That recovery allowed South Dakota State to run the clock out. Austin Sumner went 19 of 28 for 249 yards with 2 touchdown passes. Zach Zenner ran wild with 252 yards rushing and 4 touchdowns on 23 carries. He also was the leading receiver with 2 catches for 72 yards and a score. Jake Wieneke had 4 catches for 57 yards while Jason Schneider caught 4 passes for 53 yards. The Jackrabbits put up 526 yards of total offense. Montana State’s Dakota Prukop went 19 of 36 for 280 yards and a touchdown. Chad Newell had himself a game with 24 carries for 101 yards and 5 rushing touchdowns. Shawn Johnson had 8 carries for 37 yards, but did more damage in the passing game with 4 catches for 59 yards. Mitch Grabiel had 4 catches for 51 yards and the Bobcats rang up 462 yards of total offense. All eight of the games on Saturday, December 6 can be seen on ESPN3.